The official English Facebook and Twitter accounts for BanG Dream! Girls Band Party! have announced that the Persona series collaboration event will come to the English server on February 17, 2019. 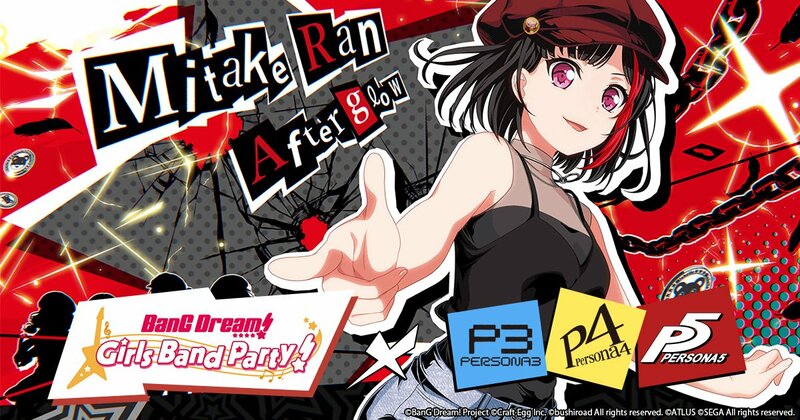 The event will come with a special story, an Afterglow X Persona 5 gacha, and 3 different cover songs from the Persona series. The limited gacha will feature the girls from Afterglow wearing outfits inspired by the main characters of Persona 5. The cover songs come from Persona 3, 4, and 5 and will be covered by Roselia, Afterglow and Poppin’Party respectively. You can check out short previews for each of the covers below. BanG Dream! Girls Band Party! is available now for Android and iOS devices. Are you ready to take some hearts with the girls of Afterglow in this special event?